Ever run out of something? What am I saying, of course you have. We’ve all run out of something. But have you ever run out of something important? I’m thinking…toilet paper. Gas. Contacts. Coffee filters. COFFEE. Oh mercy. Running out of coffee is the worst. I think of myself as a pretty organized person. Prepared, ready. But I can’t count the times I’ve run out of something really, really important. So maybe it’s a legend in my own mind type of situation? Hmmm. The thing is, it's hard to keep all stocked up with allllll the things you need. But it's harder to run out. If you’ve ever opened an empty container of Folgers at 6AM, you’re feeling me. 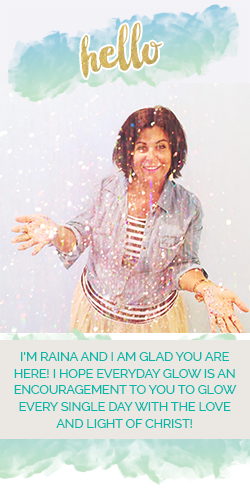 We talked in Glow last week about running out. But running out of the really important stuff. Faith. Joy. Love. Peace. WHAT?!!! Christians can run low on these things?! See, you’re embarrassed just thinking about admitting something like that, aren’t you? Isn’t that just like the enemy—to make us embarrassed and ashamed of something that happens so that we run away from God instead of running to Him when we need Him most. Breathe. It happens. We have thin places. Places where we have to keep going on purpose. Keep getting up and showing up and praying and reading God’s Word. Keep on keeping on. You’re not alone. Doesn’t that feel better? It starts out desperate, ends up encouraging. Like so many God stories. And God certainly did a miracle for this widow. She wasn’t just running low—she was running low, low, bottom of the barrel low. She only had a small jar of olive oil left. Out of everything. We don’t know what all she started with, but we know if the creditors were coming for her sons, to make them slaves, that they had already taken everything else worth taking. Talk about an empty place. So she did what we all should do—she cried out for help. Maybe she expected Elisha to wave his magic wand and fix things for her. Maybe she didn’t. Either way, he didn’t do that—he gave her a plan that relied on faith. That ever happened to you? Did it irritate you? Maybe someone gave you a Bible verse that would help you—that would fill you, that would free you from that threat of slavery—but they expected you to actually read it, believe it, live it out. Hmph. The magic wand seemed so much easier. God is so faithful, though. He wants us to trust in Him as Provider. As Answer. As Hope. He wants our eyes on Him, not on people. If you’ve run out of anything meaningful in your life today, if you have a threat of slavery hanging over your head—to fear, to worry, to addiction, to regret, to guilt, to anything other than God—I hope you cry out to God. There are other things the widow did in following through with the plan, in walking by faith, and maybe we will explore those. But it has to start with crying out, right? And we have God as an audience. Maybe the widow thought Elijah was her only hope, but we have a Living Savior living in us. 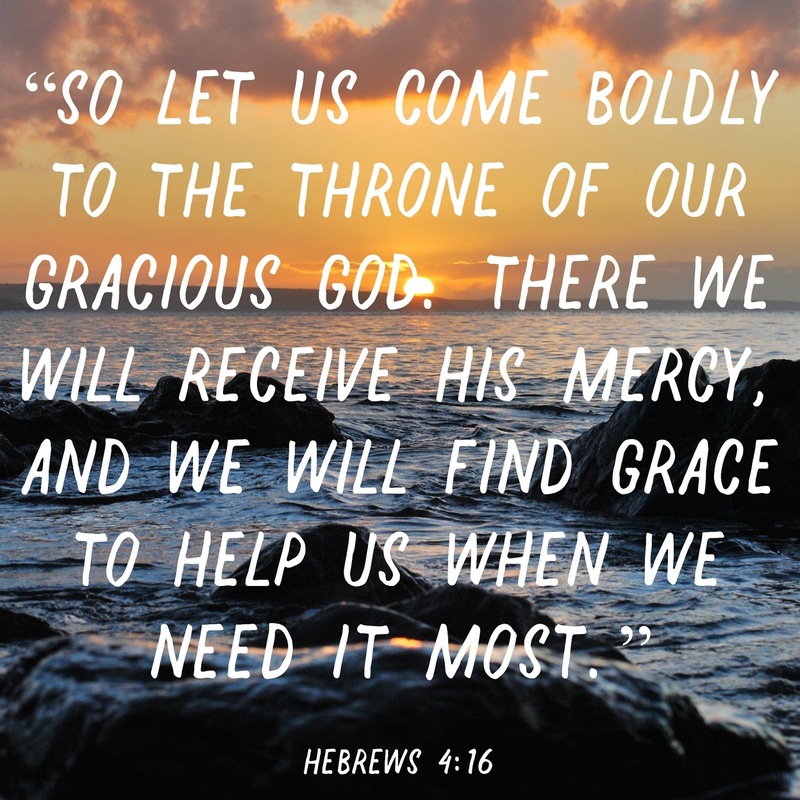 Hebrews 4:16 tells us, “So let us come boldly to the throne of our gracious God. There we will receive His mercy, and we will find grace to help us when we need it most.” Ah. 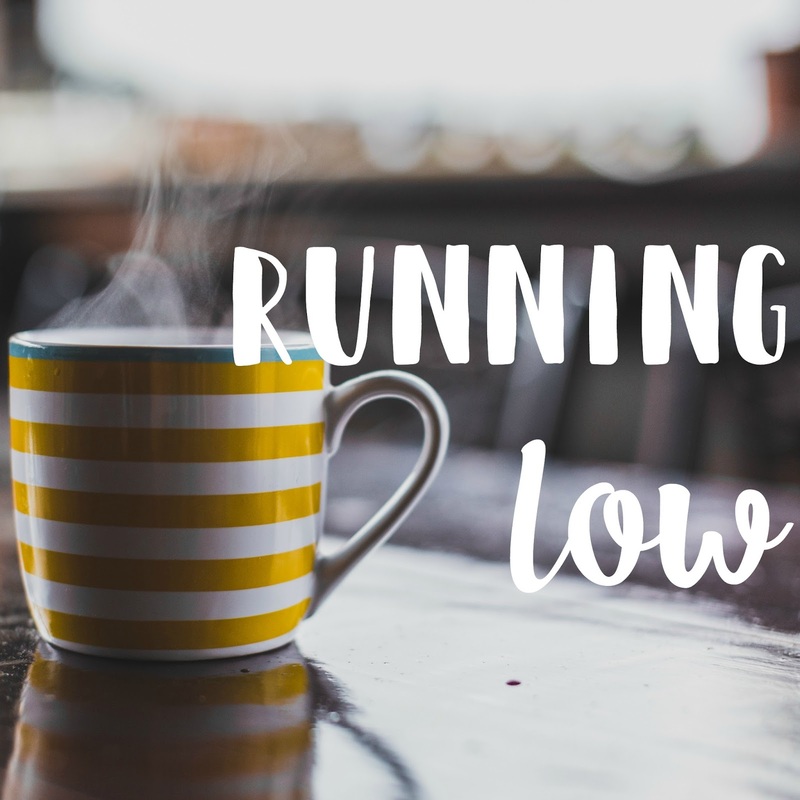 “When we need it most.” That includes when we run low, run on empty, run out. He’ll help you. You’ll find grace when you cry out to Him. Now excuse me while I stock up on coffee…..
Alright, people. We are nearing the end of January. Check-in time. How’s your year going so far? Amazing? Keeping all those resolutions? WOW. Color me impressed! Oh, wait? I hear the rest of you…not so amazing? A little rougher than you thought? I don’t know about you, but I tend to start the year on fire—full of energy, full of gumption! Here I come, 2017! You better watch out for me! Aaaaand then a couple of weeks in I find myself licking my wounds a bit and feeling like hiding rather than advancing. There can be so many reasons for this: too many goals, unachievable goals, unexpected life circumstances, charting a path for myself that wasn’t God’s path for me. I could go on. You could fill in a few blanks here yourself, I’m sure. But, God, because He is so, so good, inevitably draws me back to Himself. He knows me. He sees me. And He sees when I get discouraged because my hope has been in myself. He knows I’m discouraged precisely because I was never intended to hope in myself. I was always intended to hope in Him. Whether that hope is for a great year, or to reach my goals, or to overcome hard areas, or to walk in freedom—He is the X factor. He’s the One that gives me strength to do any of these things. Sometimes I take on wrong responsibility and it flat wears me out. Taking on the responsibility of keeping myself going exhausts me because I am not the life giver to my own life. He is the only Life Giver. And He has given me promise after promise in His Word to keep me going. Keep me looking to Him. 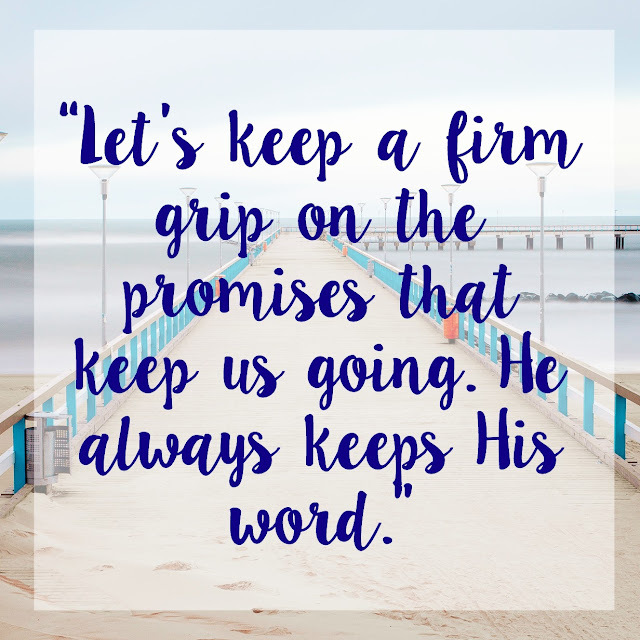 And I can trust those promises because He always keeps His Word. He can be trusted. 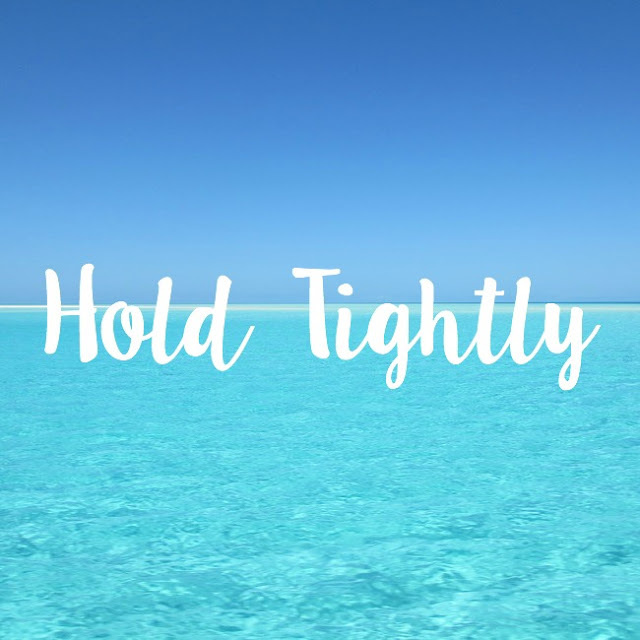 “Hold tightly without wavering”… “keep a firm grip”…these are my new and improved 2017 goals. I hope you achieve every single one of your goals this year. I hope all your dreams come true. I hope you grow and learn and become the greatest you that you can be. I hope God surpasses your wildest imagination in all that He does for you in 2017! And I hope, hope, hope for you, and for me, that we will hold tightly without wavering to God and all the true and trustworthy promises He gives us in His Word. Because then we are connected to the Life Source who helps us actually achieve all those dreams in our heart.